You've found the “U.S. Chester White Pig Breeders” page here at Hobby Farm Wisdom! If this is the first time you have visited our site: Welcome! Formerly known as the Chester County White, Chester White pigs are a breed that derives its name from the county in Pennsylvania it originated in. Developed in the early 1800’s from large, white pigs common in the area and a white boar imported from England, these pigs are a versatile breed. 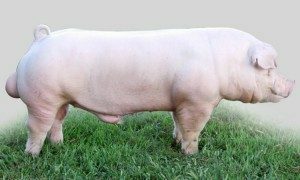 While not as common as Duroc, Hampshire or Yorkshire breeds, the Chester White is a popular breed for pork in commercial crossbreeding operations. It is considered the most durable of the white pig breeds. Cheshire White pigs can put on as much as 1.36 pounds per day and typically gain 1 pound per 3 pounds of grain fed. However, its pale coloring leaves the pigs susceptible to sunburn so it is important that they have shade in summer weather.